Big game hunting is what we do, this is not a hobby. For over 15 years HHO has guided and outfitted big game hunts full time. Our offseason is filled with work involved with preparing for the upcoming year. An extensive amount of scouting is done each year leading up to the start of the season. Between shed hunting and setting trail cams in early summer this gives us a good indication of what to look forward to and helps us answer questions our clients have on what to expect on their upcoming hunt. Year to year conditions change, keeping up on this is essential to providing a quality hunt. I was born and raised in the White Mountains of Arizona. At a young age I developed a great love and appreciation for the outdoors. Hunting became a passion and I have been fortunate to turn that passion into a successful business with great results. At the age of 19, I started my professional hunting career working under some of the largest big game outfitters in Arizona and New Mexico. I quickly realized that if I was going to make a career in the hunting industry I would need to forge my own path. In 1999 I started Hunt Hard Outfitters—based out of Eastern Arizona. My goal then was—and still is—to provide personal attention to each of our clients in order to assure their expectations are fulfilled. HHO has gained a solid reputation for providing quality hunts. 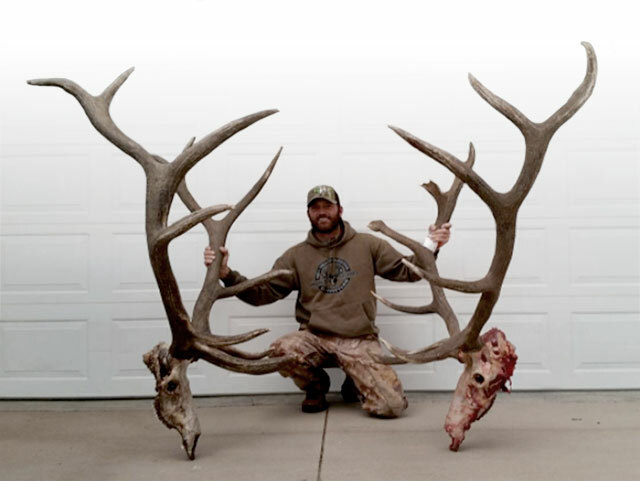 Arizona and New Mexico hold ten North American big game species. Each year the units we hunt produce some of the country’s biggest trophies. We never overbook or oversell our hunts in order to focus on the individual needs, goals, and desires of our clients. Our guides are among the best in the business. The highest qualified guides are essential to a successful outfit. We appreciate your interest in our services and hope to serve you in the future. Reference list is available upon request and we recommend you call others that have hunted with us in the past to better give you an idea of what to expect on your hunt. If you need further information please feel free to contact us at any time. We will be more than happy to speak with you. HHO exclusively hunt Arizona and New Mexico on public, state and BLM lands. We are able to offer guaranteed tags for all New Mexico Elk hunts. These permits range in cost from $3500.00 to $5500.00. The cost of the hunt is additional to the landowner permit. Please call if you have any questions regarding the details of this process. Many of our hunts focus on public land draw units. Odds at drawing tags in both states vary from unit to unit, at times this process may seem challenging, but are well worth the effort. Do not let the draw in these states denture you persistence pays off. Arizona is known for a tough draw, but this is what makes many of the areas we hunt so great. This limited draw process is what assures us of a great hunt when drawn. Each hunting package is tailored to fit each particular hunt. Depending on what time of season you are hunting and unit location will determine what package will be offered. If we are hunting a remote unit all lodging and meals will be provided by HHO. If we are hunting from a local town, you may be required to pic up your hotel and meals. Price adjustments will be made accordingly. We offer one on one hunts as well as two on one, some hunts we offer we only allow one on one guiding. Additional guides can be offered to your package, this ups your odds greatly on some hunts were you have more than one guide working for your benefit (call for pricing). We do not offer transportation from local airports. We require that you rent a vehicle and meet us in a designated area the day before your hunt starts. Meat processing and shipping are available as well as taxidermy upon request. Preparation of heads and capes for transportation will be provided. HHO does not guarantee any of our hunts. We hunt only fair chase conditions. 100% effort will be put forth for your success. Conditions such as drought or severe weather may greatly affect the outcome of your hunt. Please realize such conditions are beyond our control. We require a $1500.00 deposit due immediately upon booking. 50% due 30 days prior to your hunt, and final balance due upon arrival of your hunt, unless otherwise stated in your contract. Deposits are none refundable but can be put to a future hunt under HHO own discretion. Final payments must be made in cash or same as cash no checks will be accepted unless final payment is sent three weeks prior to you hunt date. Money sent for landowner permits must be sent in full amount as stated in the contract, full refunds on these permits will be given if permits are not able to be purchased. HHO will not be held responsible if you are not pleased with the animal you take. Our guides are experienced in field judging and can help in making decisions in the field. Only you as the shooter will make the final decision on the animal you take. This decision making goes further than just taking game, you know yourself better than we do so decisions made in the field such as food eaten, water you drink, terrain we cross, ect… will be at your discretion, and HHO will not be held responsible.